How high is up? How long is a long, long time? Every year, NAR members set national records in 15 different rocket competition events, all of which have distinct records for different motor power classes. A glossary of event abbreviations appears below. Any NAR member is eligible to set a US Record! 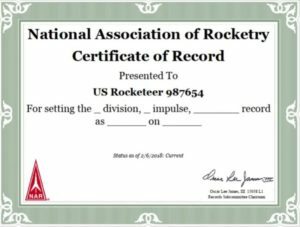 First, at a NAR sanctioned contest or event, you must make a qualified flight for a competition event in the United States Model Rocket Sporting Code (USMRSC) and return your rocket the officials. Then you must submit the attempt according to the USMRSC rules for submitting a potential national record. The easiest way is to use the link below and submit your record attempt online. Click here to submit a flight as a potential record. The records on this list are grouped by Rule, Competition Division, and Event. Thus, the first set of records comprises Rule 21 Altitude (ALT). Events have multiple categories: free flight, altimeter (/alt), and radio control (/rc). The list shows the categories in that order. The list groups the records in each category together. Each category is sorted first by competition division, then by impulse class. The first Altitude event record on the list is for free flight, A division, 1/8A impulse: 21 A 1/8A ALT. The last Altitude record on the list is 21/rc D C ALT. See the rules for each event to see which impulse classes apply. Many possible records have never been flown and established. If you do not see a record for a particular rule, division, impulse, event, and category, then that record is unestablished. For example, the B division, F and G impulse, ELA (egg lofting altitude) records, tracked optically, have never been set. This is your list. If you see anything that needs changing, please email records@nar.org . Find out if you have what it takes to beat the best! This list uses the USMRSC rule number to identify the rules under which the record was set. The rule number by itself, without a suffix, indicates a free flight (non-electric) record. For example, the free flight altitude record rule is 21. The suffix “/alt” after the rule number indicates a record set using an altimeter. For example, 21/alt. The USMRSC requires separate records for optically tracked flights and altimeter flights. The suffix “/rc” after the rule number indicates a record set by a radio-controlled model. For example, 21/rc. The USMRSC requires separate records for R/C and non R/C models. TheUSMRSC does not award records for events in which a “perfect” score is possible (e.g., Scale, Spot Landing). 34/rc B A BG 62s 10/6/2012 Brock Hampton 89505 A8-3 ? Use the Records link below to download the Records.dat file for Contest Manager, comprising the records listed above. These instructions are for Google Chrome. Other browsers will work similarly. Right click the Recrods.dat link below. Select “Save link as …” . Navigate to the location at which you want to save the file. You may need to change filenames. Save the file, either as Records.dat or as another name and rename it in the Contest Manager folder. >> NOTE: This list shows all of the altimeters approved for setting records by the NAR Contest Board. >> NOTE: Altimeter data files may not be in one of the available file types. >> If your altimeter data file is not one of the listed file types, add .txt to the end of the file name and list the file name in the Additional Information field. By checking the box below, I verify that I have read and understood both the USMRSC and the instructions for submitting a record, and that the above record submission is true and correct to the best of my knowledge. << If you see an error message after you click SEND, please ensure that you have entered appropriate data in all of the required files, including the reCAPTCHA.